64 year old Marc Spitz comes out of retirement for one last shot at Olympic gold. Sadie, I just love the new lane markers in the Mikva. God, thank you, I was always better at track and field than swimming. After much trial and error, we have concluded that air offers less resistance than water. The Israel team resorts to desperate measures. 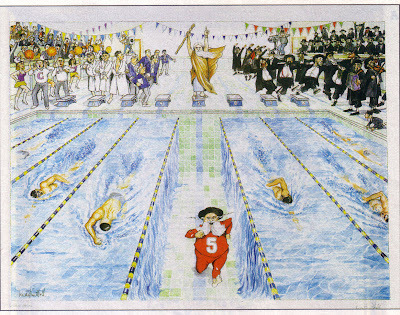 "Thank G-d, yeshiva students are exempt from the swimming requirement." "Looks just like Mark (Moshe) Split." Israeli swimmer stuns with Phelps-beating "split"
Nachshon #5, "the fragrance of certainty", available at fine Judaica reatilers. Developed for all mankind- by a real champion.